A substantial cream wall clock with a faux wooden panel face and black numbers. Dimensions:H:51 x W:51 x D:13 cm. 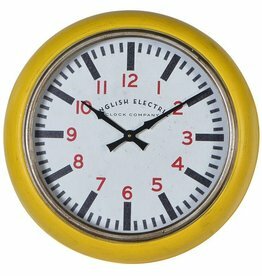 'English Electric' yellow wall clock. Antiqued black, mustard & gold. Large round vintage "Old town" clock. Made from metal, distressed finish.